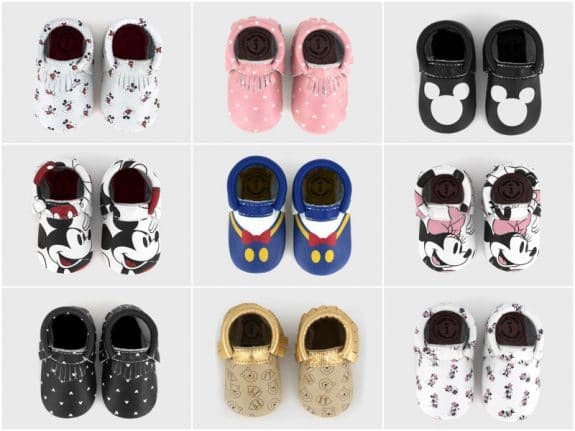 Home » 6 Disney Baby Collaborations We Love! 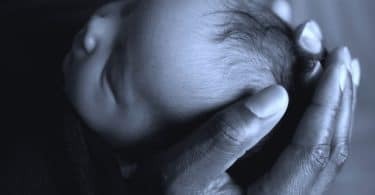 Over the past few years, Disney has worked with some popular baby brands to create gear and accessories for new parents and babies. More recently we have seen a shift from bright, bold designs to collections that are more modern and classy. 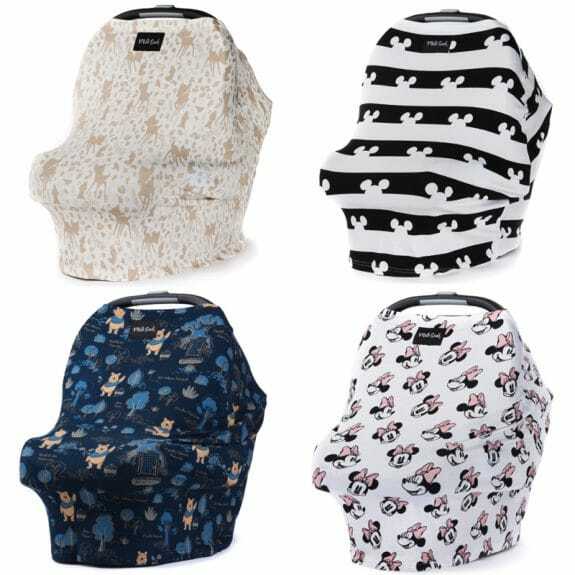 The original Milk Snob Cover is a fitted infant car seat cover that can also be used as a cover for nursing, shopping carts, high chairs, infant swings and more. aden + anais is famous for their muslin swaddles. The originators of these incredibly soft and convenient blankets, they have combined the magic of comfort with the wonder of Disney. 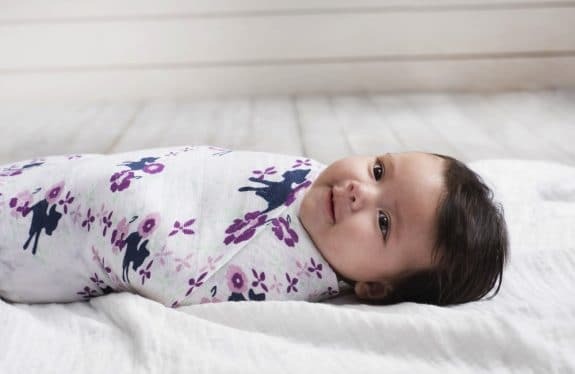 Their swaddles are a playful celebration of The Jungle Book, Winnie the Pooh, and Bambi. Breathable, and super soft these muslin blankets can be used as a stroller cover, burp cloth or nursing cover to name just a few. The Disney collection comes in packs of 4 and is priced at $54.95. Petunia Pickle Bottom has introduced 6 bags as part of their collaboration with Disney Baby. This exclusive print appears on the iconic Boxy Backpack, Axis, and Petunia Picklebottom’s Tote bag. These bags come equipped with a changing pad, PPB-monogrammed wipes case and lots of interior space and storage to hold all of your supplies for the day out. The exterior fabric is an easy-to-clean, wipeable glazed cotton canvas, with metal hardware, and genuine leather trim. 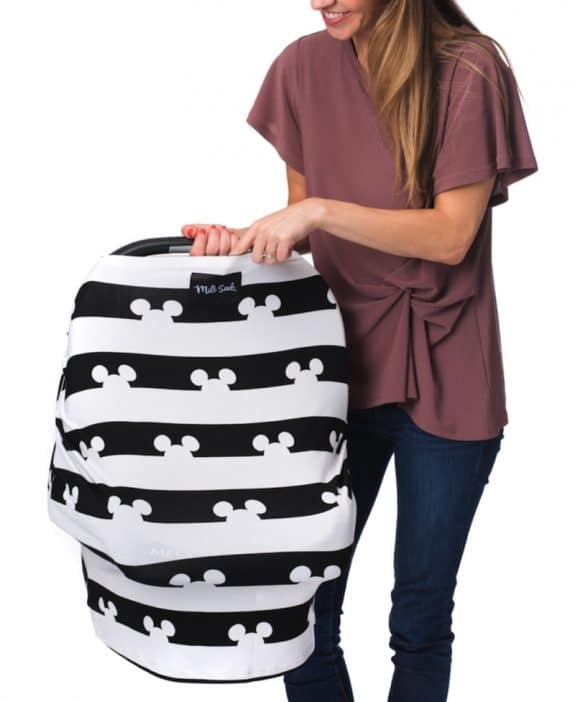 LI?LLE?baby has redesigned their COMPLETE Carrier in the All Seasons, Embossed, and AirFlow styles to include exclusive Minnie, Mickey and Incredibles 2 prints. The Complete carrier was created with every carrying positon a parent would need to keep their little one happy. 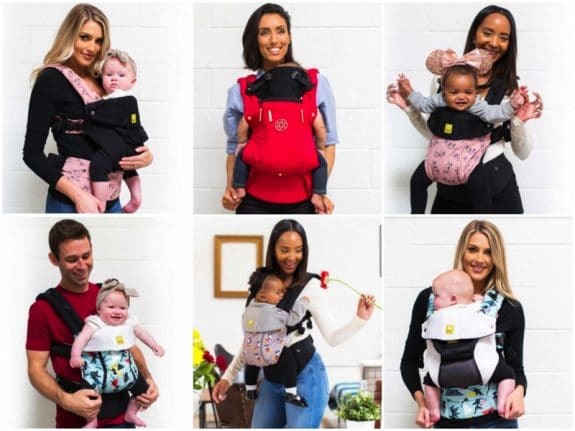 Offering Front-fetal, Front-infant, Front-outward, Front- toddler, Hip and Back carry, it grows with your child through all the baby wearing years, from 7 lbs to 45 lbs. The complete offers new parents lumbar support for better posture and to prevent back strain, a sleeping hood for privacy during nursing or while sleeping and two pockets. Wide, padded shoulder straps and waist belt also ensure the baby’s weight is evenly distributed for maximized comfort. 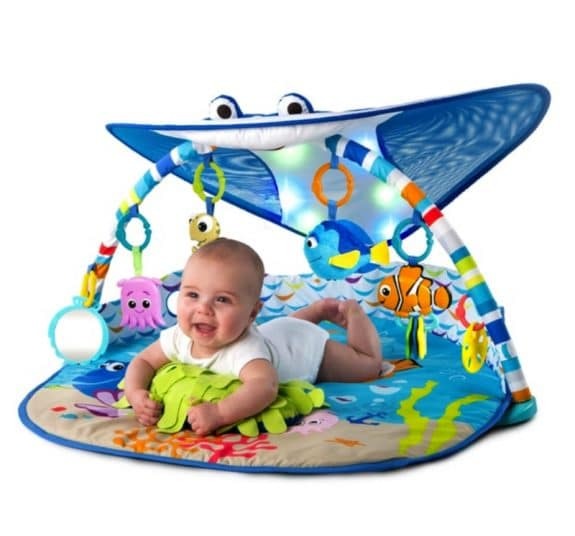 How adorable is the Mr. Ray Ocean Lights Activity Gym? And it IS bright and bold but I still think it is one of the best play gyms on the market! This incredible environment is filled with lights, music, puppet play and all of your favorite characters from Finding Nemo! Baby will love the 20+ minutes of ocean- themed melodies, six detachable take-along toys including a Dory finger puppet, baby-safe self- discovery clamshell mirror, Squirt rattle filled with colourful beads, Nemo bead chaser, tug-able Pearl the octopus, and sand dollar teether. 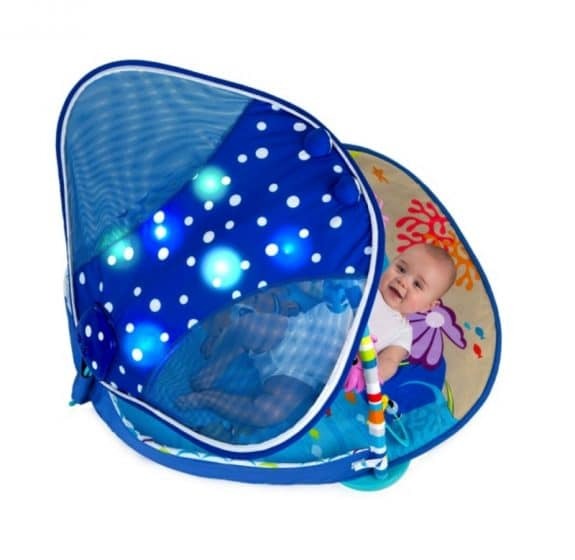 The set comes with a removable contoured prop pillow provides support for baby during tummy time and a light up canopy. 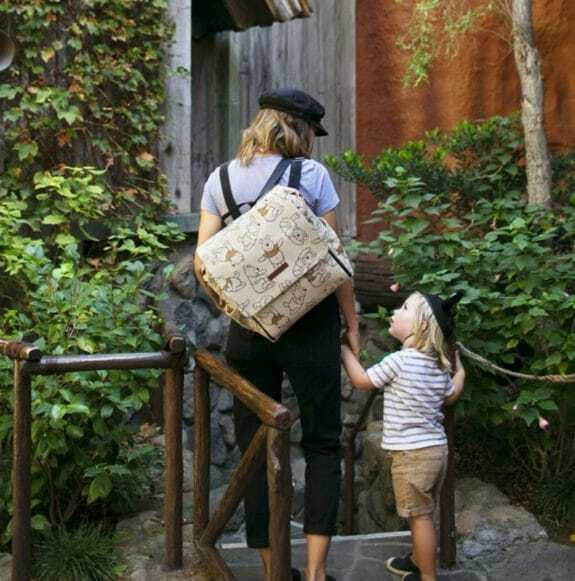 Famous for their fringed tiny mocasins Freshly Picked debuted their Disney collaboration last fall and sold out in less than an hour. Within weeks they restocked the original 6 designs and debuted 8 more. 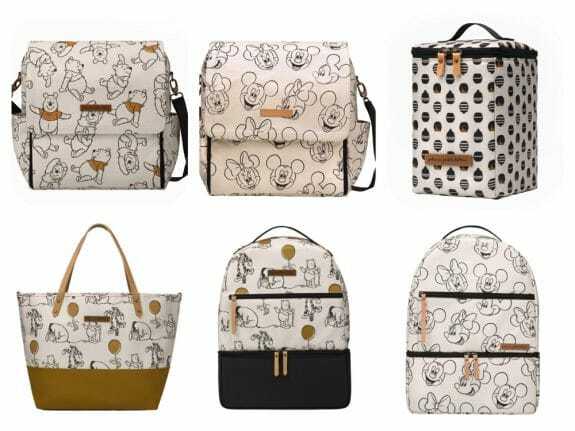 Disney fans will love the variety of styles in their collection. With colorful, graphic representations of both Mickey Mouse and Donald Duck’s signature outfits; and allover cartoon prints of Mickey, Donald and Minnie Mouse there is something here for everyone! The shoes come in infant sizes 1-7 and retail for $60 a pair.